An interesting version of Goldilocks and the Three Bears where the story is actually a play being put on by a group of penguins. A goofy, fun story with some distinctive and expressive characters. I enjoyed reading it, but I'm not sure the kids did (but to be fair I think it was slightly above their grade level). 3/5 stars. There are an abundance of "Goldilocks" retellings. We still have snow on the ground so I pulled this one to share today. The endpapers are purple--a favorite color for many children--so be sure to begin drawing the pre-school crowd in by asking the color (purple!) and who likes this colore(I do, I do!). On the story's first page is pictured a tiny ice flow upon which are standing five penguins looking at what appears to be a newspaper and one penguin wearing a Hawaiian tourist shirt peeking from behind an outcropping of ice. The only text on the page is..."In a nice, icy land, something was happening. "The "misfit" penguin is Tacky and the others are appropriately named Goodly, Lovely, Angel, Neatly, and Perfect. Irresistable slapstick fun ensues.This story works best with a K thru 2nd grade class, but a lively telling by a reader familiar with the script can pull it off with younger children. We've read many of the books in the Tacky series by Helen Lester and Lynn Munsinger. We love Tacky's crazy clothes and antics and we can appreciate his uniqueness. The stories are humorous and fun to read aloud and the illustrations are hilarious. We thought this story, with its unusual version of Goldilocks And The Three Bears, was silly and we enjoyed reading it together. A fun look at how putting on a play often feels... especially for us perfectionists! And yet all is well in the end, and once again, Tacky is able to both cause and save his friends from disaster. As always for Tacky books, the characters are fun, the drawings enjoyable and the story entertaining (though this one isn't as laugh-out-loud funny as some). Content notes: No language issues (though Lester and Munsinger do use some word puns that Tacky acts out, so be on your toes to figure them out! :) ). No sensuality issues. Only an energetic pillow fight and a not-very-steady ladder to a cookie jar by way of violence, and no one is badly injured. Goodly, Lovely, Angel, Neatly, and Perfect decide to put on a play and drag Tacky into it too. To the rest of the penguins' horror, the play proves to have a tough audience and isn't quite going according to script, but thanks to Tacky's improv it works out ok.A funny take on Goldilocks and the Three Bears. Kids who know how the tale is supposed to go should find this humorous and lends itself well to a good compare/contrast activity with more traditional Goldilocks tellings. I loved Tackylocks as a child. I loved the simple, yet expressive art style. This book is so different from many children's books, but it is a gem. It can entertain both the adult reading it aloud and the children listening. This is definitely one I would have in a classroom library for k-3rd grade! Tacky the penguin gets the lead in the school play Goldylocks and the Three Bears. When the audience is too busy playing and doesn't pay attention, the play is not off to a great start. Yet, when Tacky improvises his part, that is when the real fun begins!Used for "Penguin Party" storytime-July, 2010. This book is absolutely fantastic! I like the twist that the took on Goldilocks and the Three Bears. It is the kind of book that every child would love because of its humor and charm. The twist of having the story be a play is cute. The main character, Tackylocks is simply adorable how he goes about the story. I would read this to my own children. I love it! I loved this variation--"Tacky-style"-- of Goldilocks! "The little fuzzy ones" illustrations are so cute and I love their teacher, Mrs. Beakly, with her purple cat-eye glasses and matching pearl necklace. This book took a rough situation and made it into a fun time. It was great to see the application from the story to a play. I loved the penguins and their funny little personalities. Its a great book and I recommend it to anyone. this might be a nice book to inspire children to write their own play. The original story of Goldilocks isn't exactly this way, but that's what's nice about it. Children can discuss how it is different than usual. I love Tacky the penguin. My first graders loved this book and so did I. 5 Stars! 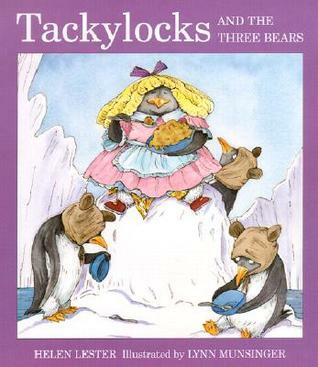 One of my favorite Tacky books with the penguins doing The story of the Three Little Bears. The illustrations were cute but the story was better. My daughter and myself enjoyed it quite a lot. Would recommend. We laugh, we cry from laughing, we choke from laughing and crying! A funny take on the story Goldilocks and the Three Bears. In this case, it's a penguin causing all sorts of havoc. Caitlin laughs just saying the name Tackylocks. I think I would have preferred watching this version of Goldilocks myself. Tacky is great! I loved this fun whimsical version of Goldilocks. My least favorite Tacky book. Tacky seems inconsistent here with the other books in the series. Story was hard to follow, really, and the ending kind of flopped here. I just love Tacky! One of the best penguin characters ever! Yeah, I like penguins. Penguins and theater: genius.